Our re-design is based upon the Open PCR system originally designed by Josh Perfetto and Tito Jankowski. The image above portrays the main heating block located inside the OpenPCR. 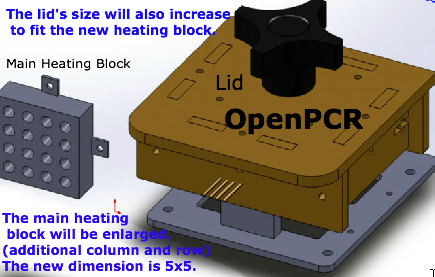 Consequently, the entire dimensions of the OpenPCR will increase accordingly, to fit the new 5x5 heating block. will increase to accommodate the new heating block. 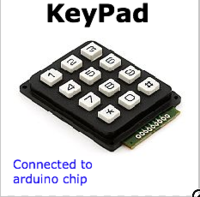 The KeyPad will be detachable, and will be connected through the USB connection. and other factors such as time and temperature. the first cycle, main cycles, and last cycles. the device, and absolutely no other technology is necessary to run it. The new OpenPCR will be assembled and operated almost identical to the old OpenPCR. connection before starting to operate the device. 1. Put 0.2 micro liters of DNA in each test tube. 2. Use a micropipet and transfer the 98.8 micro liters DNA priming mixture to each test tube containing 0.2 micro liters of DNA. *important* Use one pipet for each transfer do not reuse the pipet. 3. After the DNA priming mixture is transferred move each tube into the PCR machine. 4. Plug PCR machine in and attach the keypad to USB. a. Enter in the number of parts the heating portion will have(example First cycle, Main cycle and Last cycle=3). c. Enter temperature of each cycle in order. e. press * to begin the heating program and wait until the process is complete. 3. Open imageJ and select file, then hit open. The disease our group chose to look at was cystic fibrosis. It is a recessive trait caused by mutations in a gene on the 7th chromosome that "Causes thick, sticky mucus to build up in the lungs, digestive tract, and other areas of the body"(). This disease is life threatening and has a prevalence (at birth) of 1 in 2000 to 3000 in Europe and 1 in 3500 in the U.S. . The marker used is a two nucleotide deletion and has identy rs200007348 and a description of the phenotype along with location in the chromosome. can be found at . The disease allele will give a positive result in open pcr because both the forward and reverse primers match that allele perfectly. The non-disease allele will not give a positive result because there is a frameshift mutation between the two alleles. Two nucleotides are added into the non-disease allele (between the second, and third nucleotides before the 5' end of the reverse primer). This means that the first two nucleotides willl bind to the reverse primer, but the rest will not, and exponential replication of the disease-carrying allele will be impossible. The first sequence is the original. 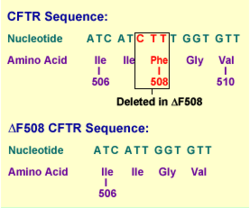 The second shows the change that occurs, the deletion of the ∆F508, and this will be picked up by the PCR. This page was last edited on 28 November 2012, at 18:07.